Ghost Dad. SAH Productions 1990. I may have mentioned a multipack of cheap movies I bought with gift money late last year, about half of which I reviewed. There are still a few more candidates in that set, but I wandered away from it for months. This is one of them. Since before I acquired the set, I’ve been reluctant to cover Bill Cosby for obvious recent events reasons (warning: serious article on an alleged humor site), but I think the moratorium has worn off, and I’ve been interested in this movie since years before I started the blog, when I saw it in a discount movie bin back when I was just starting to decide that I didn’t want to buy videocassettes anymore. The summary on the box sounds a lot like Ghost, only with a dad. 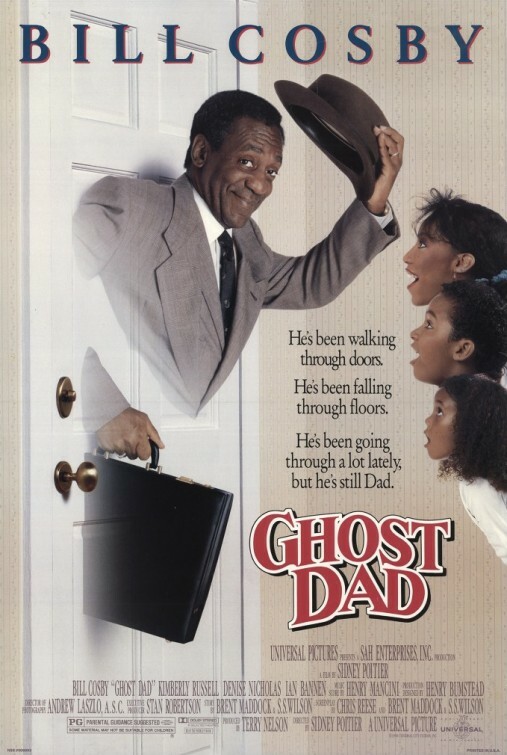 And this dad, who is a ghost, instead of being played by Patrick Swayze, is Bill Cosby, who is, as Cracked put it, America’s Dad. It essentially sounds like instead of trying to be a lover while working out the whole being dead thing, he’s trying to be a father. Which actually also sounds like Jack Frost, only not as a snowman. This train of thought is getting circular and silly, and is best dropped at this point. Elliot Harper is a widowed father putting in extra hours at work to not lose next Thursday’s upcoming promotion that will gain health insurance for his family, leaving less time to actually spend with his family. Then, walking away from a serious accident, Elliot discovers that he’s invisible, inaudible, and immaterial. He’s a ghost. Back at home, he and his kids discover that he can be seen in the dark, and can even be heard and move objects if he concentrates. After a brief interlude where paranormal researcher Sir Edith Moser yanks him into his laboratory in London and drops some Ghost Info on him, Elliot’s boss calls him at home demanding to know why he disappeared all day. Determined to make it all work for his kids, Elliot has to try to stay on this Earth, be a more involved parent, and secure the big contract until at least Thursday. This has a lot of hilarious moments. The first fifteen minutes or so plays heavily on the knowledge that Elliot is going to die and sets up not just foreshadowing, but multiple moments where it’s obvious that this is the end, and then it isn’t. The payoff being that when it really has happened and he thinks he’s escaped, the audience can believe it too. I appreciate that this story completely dispenses with the typical “I’m right here and nobody can see me” angst. Exactly one person is unable to see Elliot before he discovers how to be seen and heard, and subsequently his ghostliness is only at worst an annoyance, and often a superpower. From there he’s even able to do an extended sequence trying to fake out a physical exam. Most of the things he can do, he figures out for himself, but he needs Sir Edith “It’s A Boy’s Name” Moser to drop in to exposit some things about the nature of his predicament twice. First to give him a background urgency, and then later to give a more immediate urgency on a way to earn a happier ending than a ghost story would be expected to have (albeit with a glaring loose end glossed over). Ultimately, the story is focused on Elliot’s relationship with his kids (as the title suggests). The moral of needing to spend more time being there for his kids than earning to support his kids is rather simplistic, but the story does manage to have a decent parenting subplot between him and his eldest daughter on the friction between him wanting to parent her and her wanting to be an individual. The middle son gets a plot too, but the youngest daughter only needs to not have her father go away like her mother did. I’m not sure if she’s been squeezed out or has the most sensible position among the children’s conflicts. This was a lot of fun, and I wish I hadn’t put it off for so long. It’s too good for a ten-movies-for five-dollars box. It’s too bad it doesn’t have more of a following, star’s toxic hidden life aside. Entertainment may be tainted by associations, but it’s still entertaining.